As we drove into Bicheno, on Tasmania's east coast, we saw a sign pointing to the blowhole, so when we booked into the Bicheno Backpacker's Hostel (which I can thoroughly recomment - reasonably priced, clean and comfortable) I asked the girl about it. She was most dismissive and clearly implied that it wasn't worth crossing the road to see! However in the morning we were up early and decided to at least view the coast near the blowhole, whether it was worthwhile or not. We strolled down onto the rocky shore and gazed around, but never a blowhole to be seen. We had just decided that the girl was right when there was a whoosh and a splash behind us and we whirled to see a cascade of water running off the rocks to our rear. We waited, fingers poised on camera buttons, and despite the sea being almost flat calm, the hole erupted again. And again. And then it went quiet for over a minute - during which time someone else came down, saw where we were looking and pointing our cameras, so promptly went over and stood in front of us. To say that we were delighted when the uncouth yob was soaked would be an understatement. 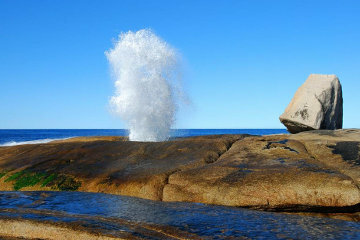 We thoroughly approve of the Bicheno Blowhole, whose sense of timing was impeccable.